Jesus spoke of a place that is prepared for those who believe and love Him. A kingdom for those who are blessed of the Father since the foundation of the world! (Matthew 25:34-40), 34 Then shall the King say unto them on his right hand, Come, ye blessed of my Father, inherit the kingdom prepared for you from the foundation of the world:35 For I was an hungred, and ye gave me meat: I was thirsty, and ye gave me drink: I was a stranger, and ye took me in:36 Naked, and ye clothed me: I was sick, and ye visited me: I was in prison, and ye came unto me.37 Then shall the righteous answer him, saying, Lord, when saw we thee an hungred, and fed thee? or thirsty, and gave thee drink?38 When saw we thee a stranger, and took thee in? or naked, and clothed thee?39 Or when saw we thee sick, or in prison, and came unto thee?40 And the King shall answer and say unto them, Verily I say unto you, Inasmuch as ye have done it unto one of the least of these my brethren, ye have done it unto me. (John 14:1-4). John describes this most beautiful place in revelation when he was carried away in the spirit to actually see the bride of Christ, the Lambs wife. 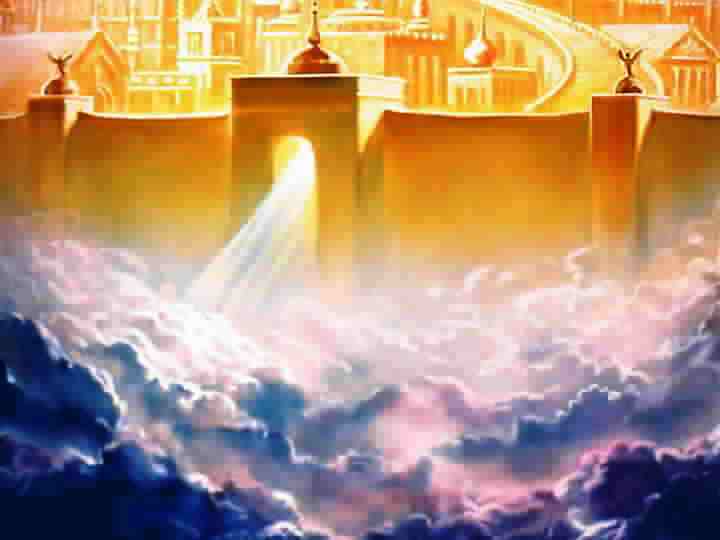 A city of God with great high walls with twelve gates that has an angel at each one and on the gates are written the names of the twelve tribes of the children of Israel. The wall of the city has twelve foundations, and in them the names of the twelve apostles of the Lamb. This most glorious city has equally the length, breadth, and height of 1,500 miles(12,000 furlongs). The foundations of its walls are garnished with all manner of precious stones with the first jasper; the second sapphire; the third a chalcedony; the fourth an emerald; the fifth sardonyx; the sixth a sardius; the seventh chrysolyte; the eighth of beryl; the ninth a topaz; the tenth a chrysoprasus; the eleventh a jacinth; the twelfth of amethyst. The twelve gates are twelve pearls, and the streets are of pure gold as clear as transparent glass! There will be no temple there for the Lord God Almighty and the Lamb are the temple of it. The city will have no need of the sun,neither of the moon, to shine in it: for the glory of God will lighten it,and the Lamb is the light thereof. So who will enjoy such a breathtaking place? It will be the nations which are saved that will be able to walk in the light of it, a city whose gates will not be shut at all by day and there will be no night there. To read of Johns experience of the city of God read revelation 21:9-27. Revelation 22:11-14 11 He that is unjust, let him be unjust still: and he which is filthy, let him be filthy still: and he that is righteous, let him be righteous still: and he that is holy, let him be holy still.12 And, behold, I come quickly; and my reward is with me, to give every man according as his work shall be.13 I am Alpha and Omega, the beginning and the end, the first and the last.14 Blessed are they that do his commandments, that they may have right to the tree of life, and may enter in through the gates into the city.